Subdomains vs Subfolders: What's the Difference and Which Is Better for SEO in 2019? ToTheWeb.com's Rosemary Brisco was arguing with some clients about whether subdomains or subfolders are superior for SEO ranking. Her clients were somewhat knowledgeable about SEO and heard some alarming things about the 'subdomain vs. subfolder debate' -- which has become an even more important one in 2019’s technical SEO environment. Brisco brought the matter to the attention of the savvy digital marketers at Moz, starting an interesting conversation about website architecture and SEO ranking. The fact that the question of 'subdomain vs. folder' requires its own Q&A thread, means that emotions run high for this topic and rightly so as analytics show the results of making the wrong choice can be disastrous if you don’t plan correctly. So how do you decide which link structure is right for your website? To help get to the bottom of whether a subdomain or subfolder is better for your SEO, here's a thorough examination of the issue. Let’s start with definitions to get a clear picture of what subdomains and subfolders are in internet parlance. 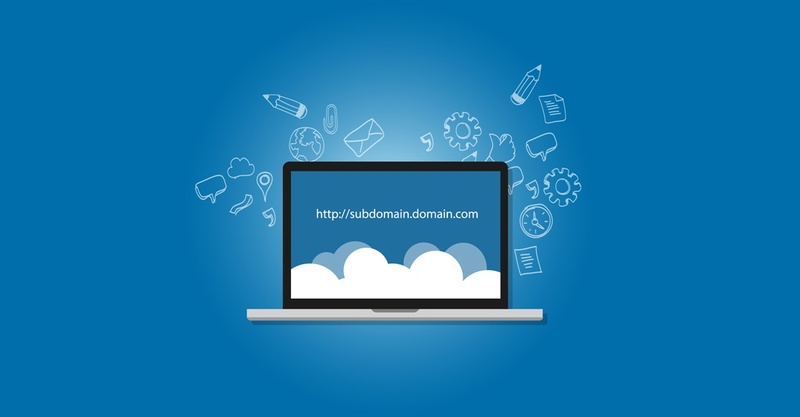 Subdomains vs. Subfolders: What's the Difference? Subdomains and subfolders are similar in a lot of ways. They’re both file locations inside of a server’s ‘Home’ directory structure and the Home directory for our purposes happens to be a URL. A subfolder is a ‘child directory’ (a folder beneath another folder) that lives under a parent (Home) directory, as is a Subdomain. But the subtle differences that come into play here are where things start to get interesting. While both are content repositories, subdomains are also URLs which means you can access them just like a regular website address. They’re not just paths within a domain like subfolders are. It’s this difference that affects your website's ability to gather and rank keywords. Let’s dive further into that difference so we understand what it means for content indexing and its impact on SEO for your domain. What Does a Subdomain Look Like on a Server? A subdomain is a partition of a website that operates almost as an independent entity. It is distinct from the rest of a website and typically, its address is to the left of the root URL. Some examples of subdomains include https://blog.hubspot.com/ and https://blog.trello.com/. Subdomains are generally used when a portion of a website requires its own server. In the early days of the internet, server space and memory cost more than today’s Bitcoin prices. Server admins would create subdomains to allocate resources across all the machines they had capacity on. Let’s say the accounting department needed their own internal website for reports. A few strokes of the keyboard later, and accounting.yourdomain.com was born. All the bean counters now had their own memorable segment beneath the corporate URL. As the web matured, subdomains were used to host mobile versions of websites. m.yourwebsite.com is still a prevalent use of a subdomain, but this is changing with mobile first indexing and smarter content management systems that include mobile responsive code. Global companies sometimes use a subdomain to host foreign language versions of their site or file heavy things like blogs and downloadable resources. Now, this sounds great for organization, but what benefit does it have for marketers? Well, first off, a subdomain tends to gather keywords independently of your root URL. This means that accounting.yourdomain.com has its own bundle of keywords, separate from yourdomain.com. In other words, if you are trying to rank for the keyword “marketing KPIs” with a page hosted on your subdomain, your main domain may not rank for it, and vice versa, a keyword accounting.yourdomain.com ranks for, your subdomain will not necessarily rank for. This may or may not make sense depending on your specific situation. For instance, let’s say you do business in Spain. Your Spanish office needs their own domain to earn authority there, but you’ll want a separate domain, so you can maintain your global brand under your main URL. In this case, something like “spain.impactbnd.com” is a great solution to consolidating your offices under one umbrella, while letting keywords gather in Google’s Spanish database for that subdomain. Use cases like these are why a subdomain vs. subfolder strategy session needs to be high on your priority list. Subdomains are useful for audience segmentation as well. Let’s say you run an e-commerce site that sells t-shirts, and you host a weekly podcast that teaches people how to start & run an online t-shirt business. The audiences for each business are very different, even if they are related to the same theme. The podcast listeners want to learn about the t-shirt business, while the shoppers are looking for their favorite Avengers gear. Putting the podcast listeners website under a “podcast” subdomain keeps the business related keywords separate from the online store phrases you’re trying to rank for. When planned strategically, a subdomain is also clear and to the point, in turn improving user experience. They tell a user exactly what to expect when clicking that link. For example, a country.yourdomain.com URL like those employed by multinational companies makes the distinction for users that what they’re accessing is specific to their location and may differ in other countries. Because of this, a subdomain is useful for franchises, as well. Each franchise location has its own address, phone number, and content. Similarly, it can have its own subdomain. So, What About a Subfolder? Subfolders are the easier site structure to set up and understand as they are the same as setting up any other folder on a website. A subfolder is similar to a subdomain in that it allows you to create categories of content, but they are set up differently on servers. Unlike subdomains, there is no server partitioning involved with subfolders. A subfolder is housed on the same server and any of its link juice goes back to the domain. An example of a subfolder web address is https://www.impactbnd.com/blog. With this structure, all of the pages associated with IMPACT’s blog feed the authority of the main domain. The biggest marketing benefit of subfolders comes in the form of keyword density. As mentioned above, the keywords of a subfolder are owned (collect beneath) your main domain which makes them an excellent choice if you want all the keywords on those pages attached to your main URL. Most technical SEO tools report keywords assuming this. Take SEMRush (seen below) for example. In the tool, you type in a domain name, and they tally up all the phrases the site ranks for to give you an estimated monthly traffic value. In most cases, this is exactly what you want; All your freshly baked keyword goodies in one URL basket. Why? Because the words and phrases you use across the pages of your website send signals to search engines that tell it what your site is all about. Subdomains vs. Subfolders: Which Is Better For SEO? One of the reasons the subdomain vs. subfolders debate is a sore topic in SEO circles comes from comments made by Google itself. Google's head of search trends, John Mueller, claims the search engine has gotten much better at identifying subdomains of the main website and allocating keywords where they belong – to the root URL. Reading this, you would think the argument is over and the SEO community can go about their business slaying 404s….The ivory tower said the debate is now a moot point, right? In the SEO trenches, where overwhelm is a real thing, suppositions frequently look like Gremlins; They’re cute and cuddly at first, but feed them at night, and they bite you in the analytics. Moz called an audible because what its data was saying didn’t match what Google was saying. So it tackled the issue, looking for analytic proof to that keywords accrued by subdomains are allocated to the root domain. The team posted several useful case studies to illustrate the risks of the subdomain controversy and distilled its findings in a video on its Whiteboard Friday series. What Moz found is that, by structuring your site with subdomains, you risk confusing search engines and producing undesirable results like separating a large portion of keywords under the subdomain, or diluting backlink strength. Backlink strength was consistently found to funnel to the subdomain, diluting keyword density away from the main domain. After this experiment, we had data to back-up arguments against Google’s claim. Converting from a subdomain to a subfolder structure isn’t difficult, but external backlinks which point to the subdomain can break if redirects aren’t added. It's hard to reach a consensus on this debate with so many different opinions, but let’s read what the experts at Moz weighed in with. Based on its research, Moz concluded that subfolders are best for SEO due to the different metrics being returned by various search engines. It only advocates using a subdomain for foreign language variants of a main website, if needed. Subdomains are also great if you have content that’s thematically very different from rest of the content on your site (i.e. IMPACT’s blog). If you aren’t using marketing software with its own analytics (like HubSpot, for instance), subdomains are useful for storing landing pages or calls-to-action when you need to track metrics via Google Analytics or UTM tags. The takeaway? 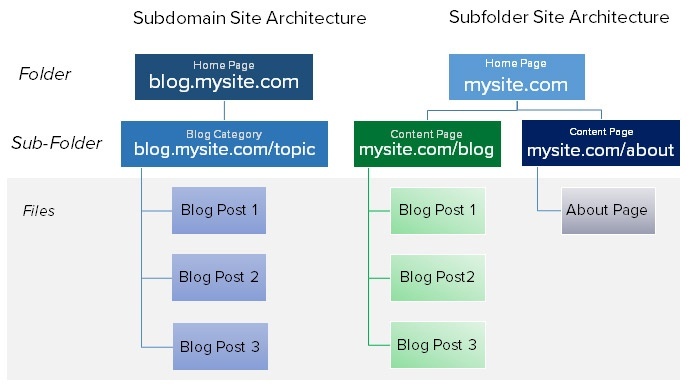 Website architecture is always going to be a matter of necessity and taste, but in most cases, you’ll probably want a subfolder structure versus a subdomain. As search engines continue to evolve at the speed of thought, the subfolder vs. subdomain controversy will quiet down. Until then, subfolders are your safe bet for SEO ranking.